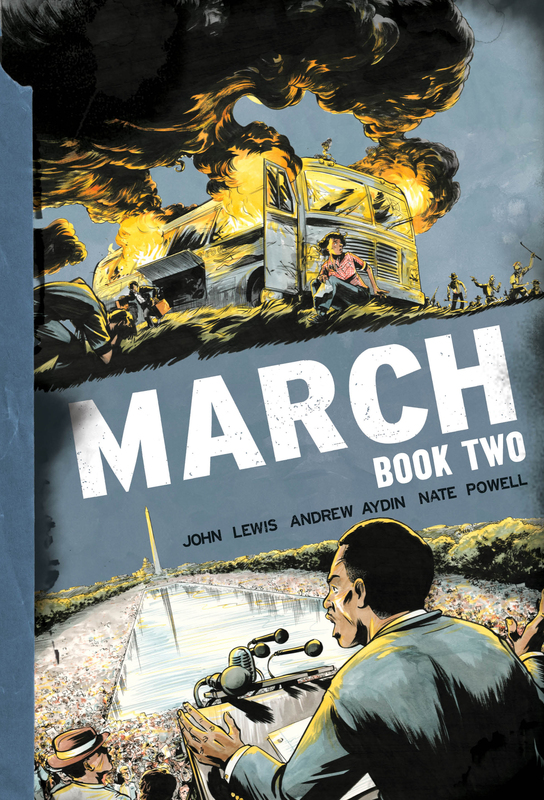 The second installment of Rep. John Lewis’ illustrated history of the civil rights era, “March: Book Two” has a newly designed cover and a tentative release date: late January of next year. Top Shelf Productions spokesman Leigh Walton said Lewis would not be traveling to San Diego next week for Comic Con, as he did last year . Congressional aide and co-author Andrew Aydin and artist Nate Powell are making the trip, and are expected to update fans about the planned trilogy Friday, July 25 at noon during a Top Shelf-led panel discussion. Per the promotional materials, Book Two appears to pick up several months after Book One drew to a close (spring 1960), with the Georgia Democrat continuing to exercise his commitment to non-violent protest by hitting the road with the Freedom Riders and, ultimately, helping to lead the history-making 1963 march on Washington. “Pre-orders are already coming in for Book Two,” Walton said of the mounting interest surrounding the ground-breaking set of graphic novels. Much like Book One, the next episode of Lewis’ extraordinary life will be available in paperback, hardcover , and as a limited edition, autographed collectible.